You won’t need me to tell you that John Forester is the ‘father of vehicular cycling’. For decades American society accepted incompetent operation by cyclists as a consequence of keeping cyclists out of the way of motorists. The acceptance was tacit instead of explicit; nobody really wanted to admit it, and the laws, contradictorily, both required and prohibited operation in accordance with the rules of the road. Now government demands, as a patriotic measure, that bikeways be installed specifically to encourage a greater volume of incompetent cycling. both of the two major groups [motorists, and cycling advocates who want bikeways] want cyclists to operate in the fearful, deferential, and incompetent manner, while bicycle drivers want to operate in the confident and competent manner of drivers of vehicles. At its most extreme, this viewpoint extends to blaming the victims of collisions with HGVs. According to Forester’s logic, it is a failure to ride a bike in his ‘proper manner’ – that is, exactly like a motor vehicle – that has directly caused people to end up under the wheels of lorries in London. Sustrans has often cited the fact that Dutch cyclists sometimes leave the ferry at Harwich and find traffic so difficult to deal with that they go back home! Interestingly, this problem is not experienced by cyclists arriving from France, Spain or the USA. Proficiency in using roads on a regular basis is essential to maximise safety, and to maximise one’s cycling horizons. 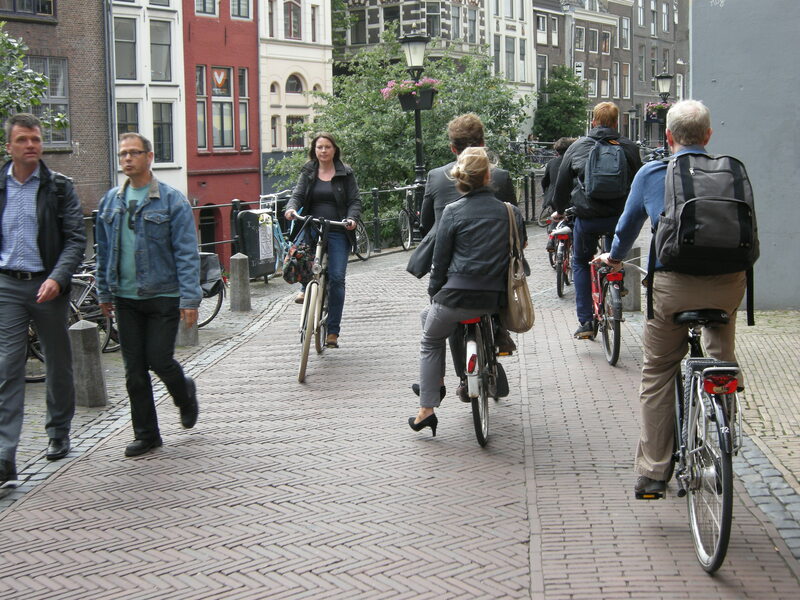 I would not like to see Britain on the slope down to Dutch levels of cycling competence. The concluding word is a giveaway. ‘Competence’ for Franklin – just as for Forester – means the ability and willingness to ride in motor traffic. In this version of events, those Dutch tourists who arrived at Harwich, saw the conditions they were expected to cycle in, then turned around and went home, lacked the ‘competence’ of their British and American counterparts. Of course, those Dutch riders were in an all likelihood perfectly capable of cycling on British roads – they just didn’t want to. They were competent, but unwilling, a distinction Franklin is apparently blind to. 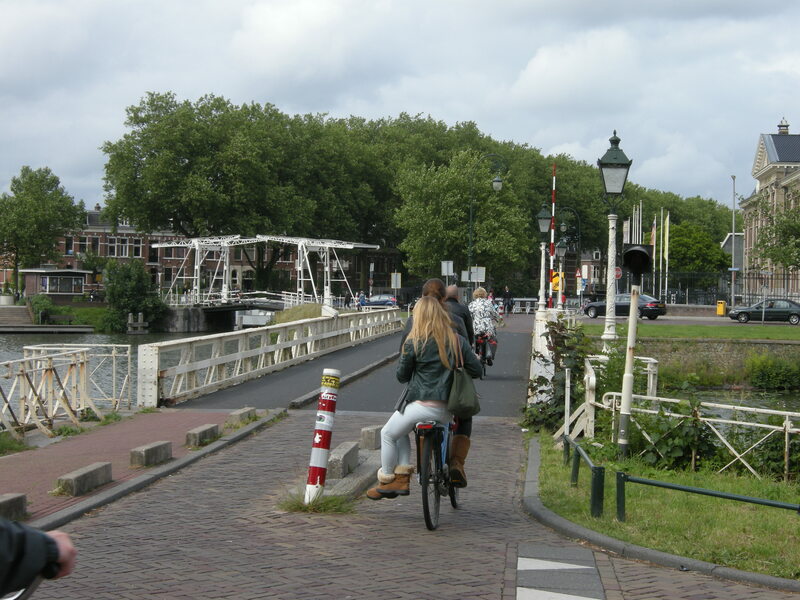 It was the unattractiveness of the cycling conditions that pushed the Dutch tourists back on to the ferry, not any lack of ability (indeed, the unattractiveness of the John Franklin model of cycling has recently been dissected). 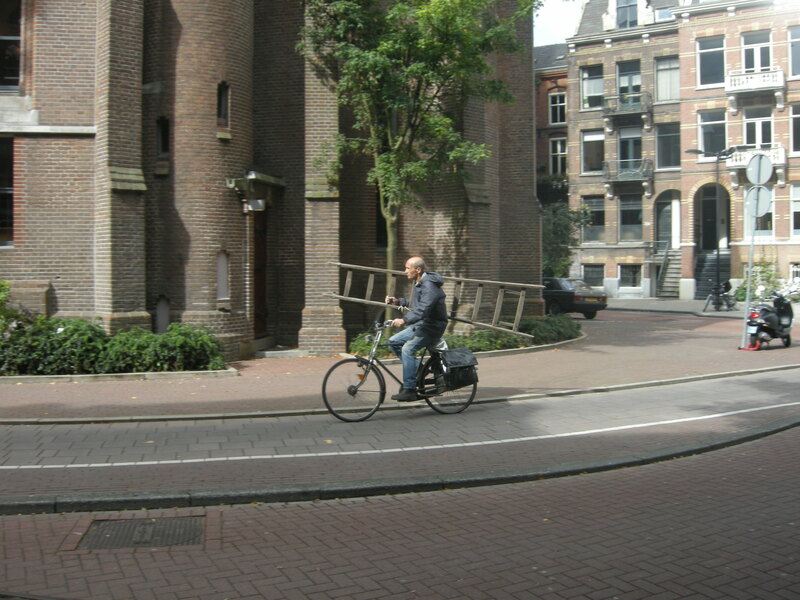 Dutch cyclists are of course perfectly competent at riding on roads, as well as on cycle tracks and paths. It is, frankly, completely insane to imagine that the reason some Dutch tourists refused to ride on the main road out of Harwich is because the Dutch nation, as a whole, is worse at riding bicycles than the British or American nation. They just didn’t want to ride in British conditions, any more than tourists wouldn’t want to walk through dangerous or forbidding areas. 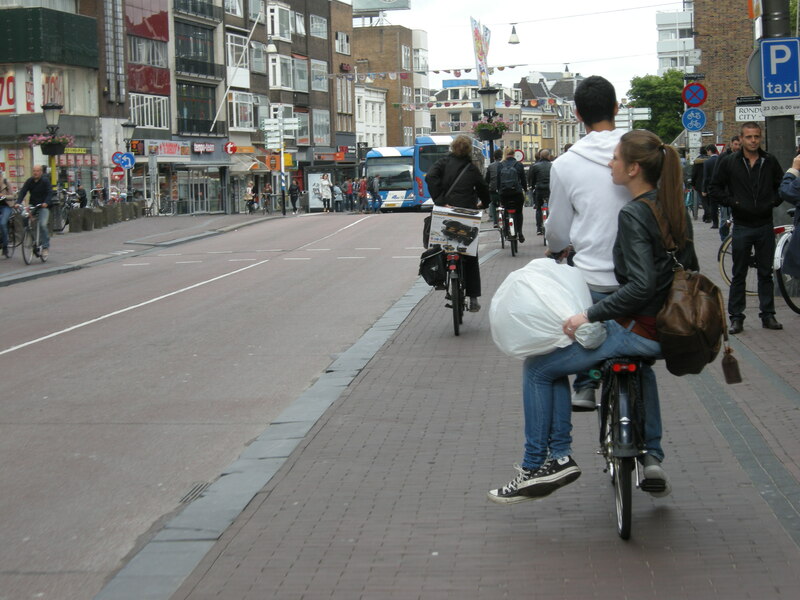 On any visit to the Netherlands you will see ample evidence that the Dutch are actually highly skilled bicycle users. They can easily ride along while propelling a bicycle for someone else. They can give people lifts. They can ride with umbrellas. 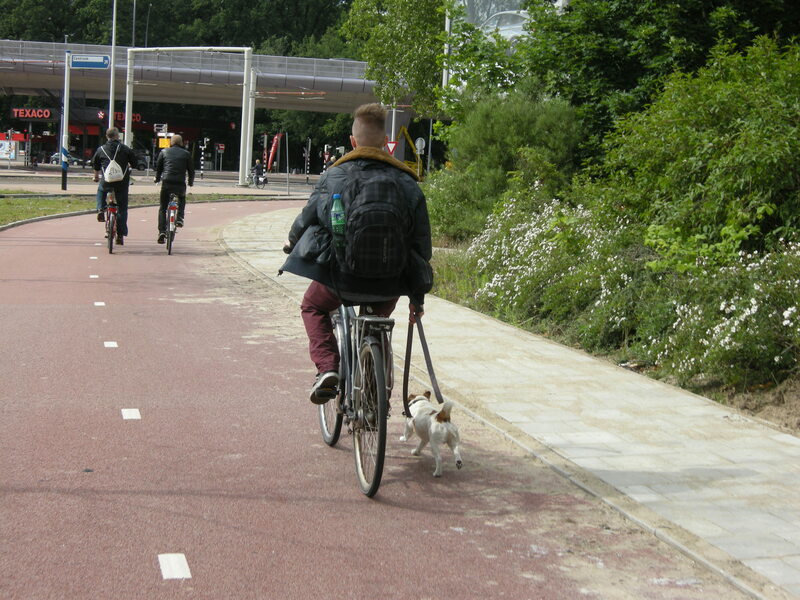 They can even cycle with their dog, with someone balanced backwards on their handlebars. Are these examples of ‘incompetent’ or ‘competent’ riding? It’s certainly not the kind of cycling you would want to do in motor traffic, so I suppose it doesn’t conform to the incredibly narrow version of ‘competence’ that Franklin and Forester use. What they really mean when they refer to ‘incompetence’ is an unwillingness to do things their way. I’m quite glad the Dutch are free to be incompetent. I’d like to be incompetent too. 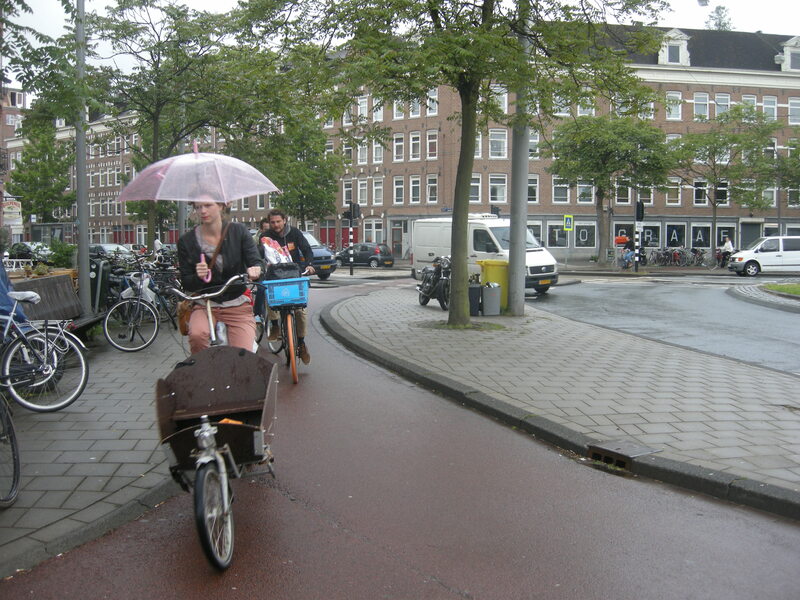 This entry was posted in Cyclecraft, Cycling policy, Infrastructure, John Franklin, Subjective safety, The Netherlands. Bookmark the permalink. Apart from the point you are (rightfully) making: Is not the fact that it takes less competence to ride on cycle paths than in traffic EXACTLY an argument IN FAVOR OF cycle paths? Both cycling and driving a car take more competence on an uneven surface of rough sand and stones than on a well-laid concrete surface. Is Mr. Forrester suggesting that it was a bad idea to create roads with flat, solid surfaces, because it decreased the competence of bicyclists and drivers alike? Usually, that is not what we do. Usually, we prefer to make the things people do easier and more comfortable, not make them more challenging so they learn more from it. Of course, the opposite from what he’s saying is true. Cycling infrastructure increases, not decreases cycling competence. 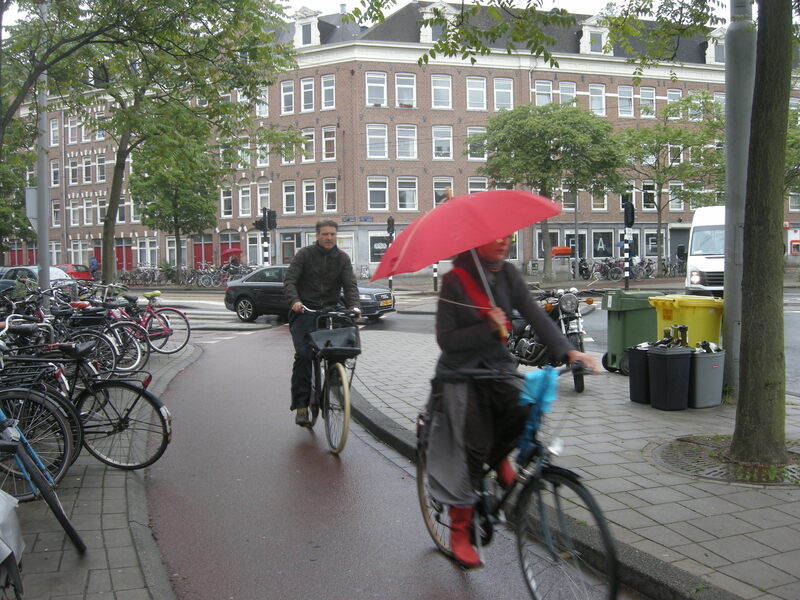 It increases it by getting more people to cycle more, and the simple act of doing it increases one’s competence. There’s one point where Mr. Forrester is right though: there are more bicyclists with low competence in the Netherlands. But if they lived under his preferred conditions, they would not be more competent. They would not be bicyclists at all. It’s only an argument in favour of cycle paths if you start from the position that more people making more of their journeys by bicycle is a good thing. What you have to understand about Forrester is that he explicitly does not adhere to this position. He lives in a (pre)1970s world where he’s quite happy for cycling to be a niche pursuit for his kind of people, and where there is no problem whatsoever with the rest of the population being condemned to car dependency. Franklin appears to adhere to the even more mad position that more people making more of their journeys by bicycle is a good thing, but that vehicular cycling somehow has something to contribute to achieving that outcome. That said, I wouldn’t spend too much time worrying about their positions. Both have rapidly descended into irrelevance in cycling policy discourse, and will soon fade away altogether. 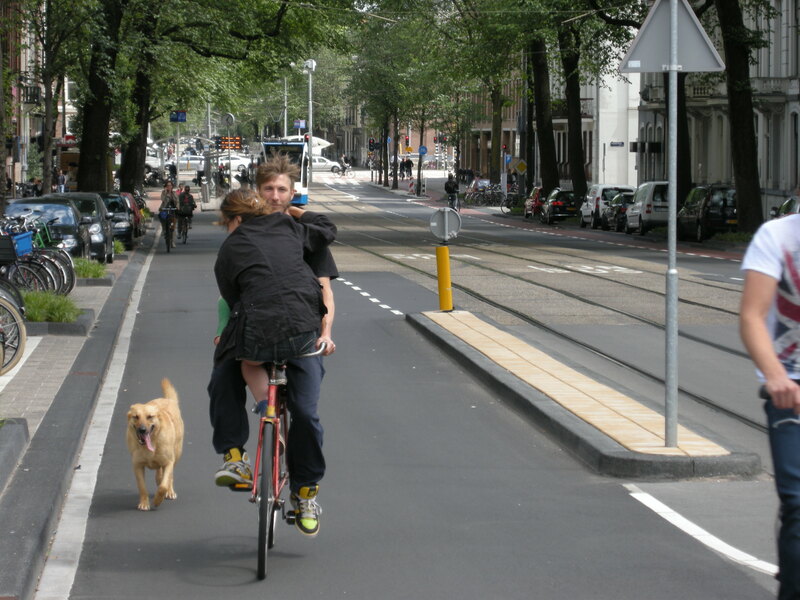 What about the fact that the Dutch foster more disabled cyclists? Competence is a funny thing, you could argue that you have to be more skilled, experienced, confident and possibly technically more proficient in the UK to ride a bike, this is what he’s saying but what about the people out there who could cycle perfectly well but have special needs? The bikes themselves are harder to ride in the UK – you buy a bike in tescos, they sell you a full suspension mountain bike with no chain or mudguards. You buy a cheap bike in Holland, you get a single speed with pedal back brakes, mudguards and chainguards. Not to mention that everyone will be able to help you sort out what you need, there are bike shops every hundred yards, you don’t buy a bike in the Supermarket. We are getting loads more mums riding with their kids to school on these full suspension monstrosities from Tescos or Halfords, how long before they catch their clothes in the chain or they give up because they got soaked all the way up their backs riding through a puddle. Any old moron can pass their test and pootle around in a car they have no idea where the fog lights are, they soon forget how and why they should indicate or dip their lights at night, they never check their tyres and getting away with speeding is just a game. Riding a bike in the UK for any length of time requires creativity, adaptability, experience, confidence and getting past the stage of buying cheap rubbish bikes and reaching the point where you either had the fortune to know someone who can help you find the right bike for you or just got there in the end. There are no prime time adverts, magazines comparing entry level options (other than road racing and maybe touring). I am a subscriber to Women’s Cycling Magazine and they do do have articles about town bikes, but how many women who aren’t planning on taking up cycling as a sport will buy it and WHSmith get one copy if you are lucky so good luck finding it. Cycling in the UK is a weird mix of very elitist – only for the clever brave and strong and yet still seen by the majority as the poor man’s choice, that you are less than complete if you don’t have a car you can drive. He’s the same type of idiot like Michael Gove who sees everyone who isn’t Oxbridge material as not trying hard enough. Well said, yet again another fab blog post. Motoring is held up as the standard of how to move around on roads – but odd it isn’t cascaded down to pedestrians as well? Does providing separated pavements make people less competent pedestrians? Its unadulterated claptrap and should be shown to be so wherever it shows up. 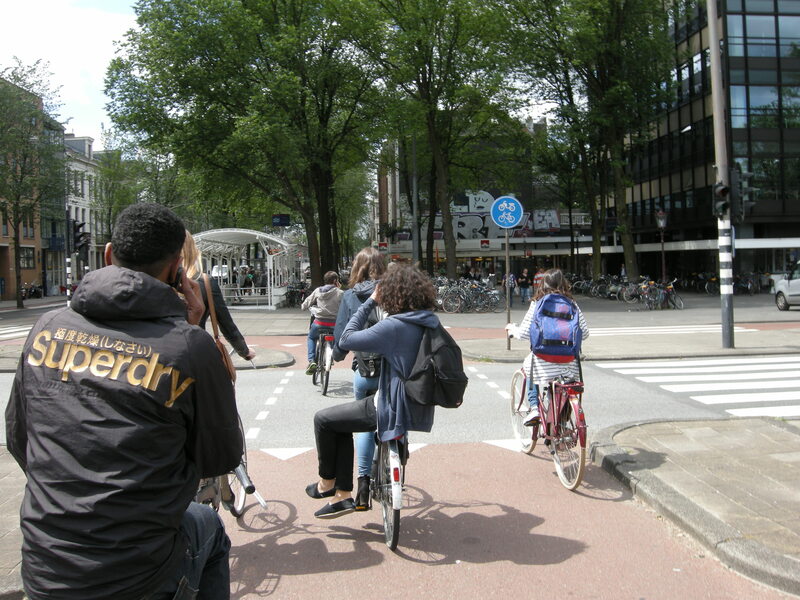 As Mr Superdry in your photo shows, you can also cycle while holding a conversation on a handheld mobile -a practice which would be frowned on here (perhaps is illegals as it is for mootorists?) and would probably be regarded by many as making yourself more vulnerable to motor vehicles because attention is distracted/hands are full etc. No-one would say that however of our nearest equivalent situation – a traffic-free forest track in some nice Forestry Commission property like Alice Holt. Entirely outside the competence debate, I think animal welfare groups would frown on taking a dog for a “walk” on a bicycle – it denies Muttley the opportunity to stop and sniff at lampposts etc along the way, which is as much the point of walkies as getting exercise. f.y.i. 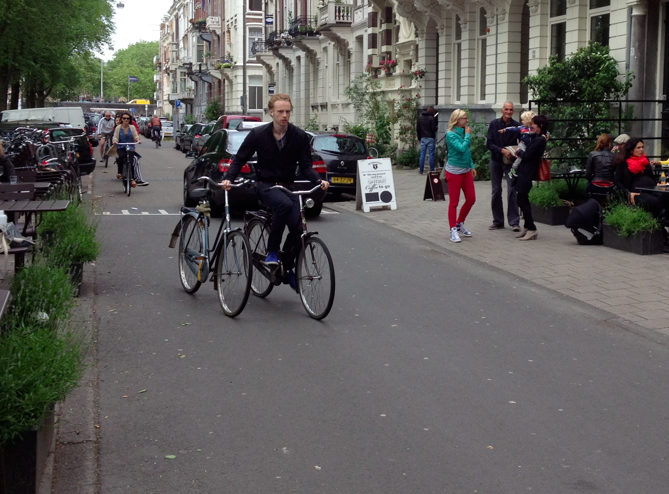 : using your mobile on your bike in NL is illegal – as illegal as using it during driving a car. However, as the potential consequenses are far greater for chauffeurs there has been ample police action on mobile use in cars, and hardly any for bike users. BTW I don’t see many calling on their bikes. Texting happens more often, but seems to fade off. Once again an eminently sensible post. In many ways our children are like Dutch tourists. Our roads are too dangerous for them to learn to ride bikes on, then at some point, it suddenly becomes morally unacceptable for then to ride on the pavement and they have to join the traffic on the roads, which they have no experience of because it was too dangerous for them to ride there when they were growing up. So guess, what? They don’t bother. 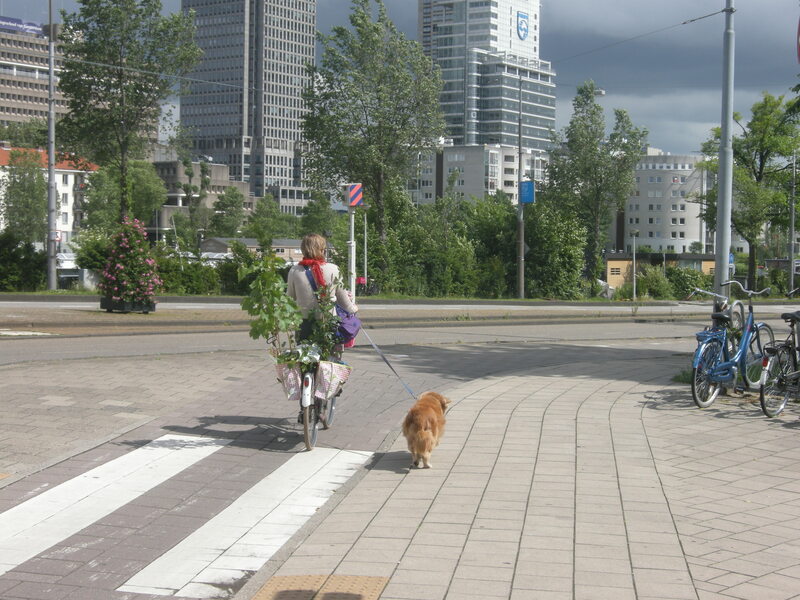 I’d also like to point out, int the first picture of a dutch lady riding with her dog, she has also brought her own tree along in her panniers. That’s not incompetent is it? She didn’t have the tree or the dog when she started, it was just a happy accident. Seriously though, I agree with what you say about the kids on bikes, where are they meant to ride? It takes quite some skill to be able to ride alongside other cyclists and while not constantly drifting towards the left or right. Such was my experience during my two visits to Copenhagen. While here in the US, whenever I would ride with a few friends (who all rode racing bikes and were quite capable of riding in traffic), I found myself constantly having to alert them that they were about to drift into me and cause a crash. They were not great at riding in a group setting to say the least! Put it all together: 2 bikes, a ladder, one passenger, one dog and an umbrella -> sounds like you’ve got an awesome circus act in the making! I think you might be dignifying Forester’s rhetoric a bit too much. His entire ideology is contradictory! 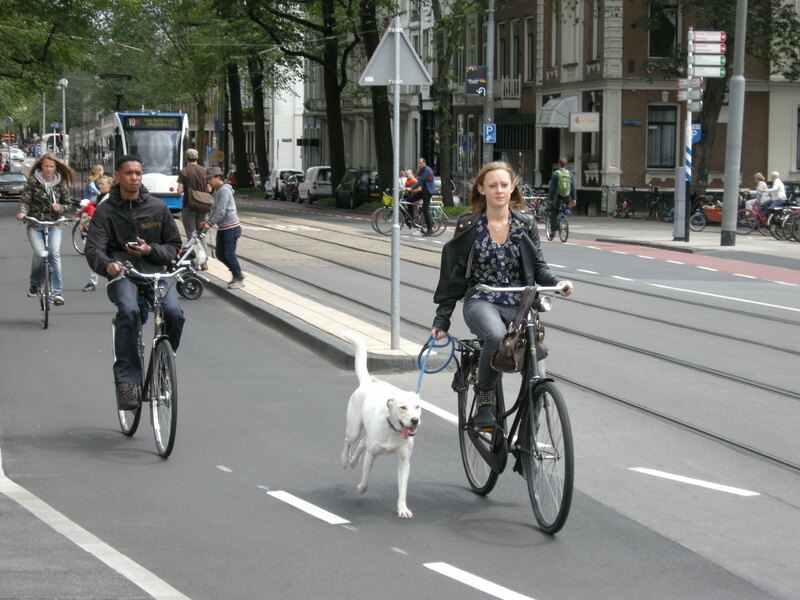 One can never “drive” a bicycle as bikes and cars are inherently incompatible. Insistence on pure vehicular cycling is an assurance that cycling rates will always remain severely suppressed. Pardon my remark, but Forester himself is approaching an age when he will surely suffer the effects of no longer being able to “drive” his “vehicle” properly. Perhaps he’ll finally come around. Fine points Corey. I would dearly like to see friend Forester taking the lane while pedalling up a 10% gradient,with horns blaring and abuse hurling. Does he also advocate that granny and twelve year old Charley take the lane as well? With the same ‘logic’ one could note that we’d all become much more ‘competent’ at dealing with dangerous wild animals if large numbers of bears, honey badgers*, and tigers were to released to roam the streets and fields of the UK. Its scandalous that our levels of competency in this respect have been allowed to decline due to the lack of deadly predators within our shores – this must be rectified! In the same spirit, we need more criminals and fewer police, so we can all improve our ‘competence’ at coping with crime. And let us leave IEDs and cluster bomblet munitions all over the country, so we can become as ‘competent’ at bomb disposal and surviving explosions as people are in those countries where such things are common. There are any number of ‘competencies’ that are lost or not gained at all because the deadly hazard they relate to dealing with has either been removed or never existed in the first place. So what? Is there some moral benefit in creating unnecessary hazards and dangers, just so one can delight in developing the ‘competence’ to try and cope with them? The demand seems to be, that we should create unnecessary dangers just so Forrester and his cult can feel manly and ‘competent’ at enduring them, even when it reduces human welfare overall. This seems a bit insane to me. Actually, more charitably, I think his real problem is he is so deeply immersed in the cult of the motor car, that he sees their presence in large, badly-driven, fast-moving, numbers everywhere, as being a kind of unchangeable fact of nature, rather than a man-made phenomenon and a relatively recent one at that. Consequently he sees learning to ‘competently’ survive around them as being some sort of fundamental human skill, that humans must have had for millenia and will always need, like being able to swim or to read. Actually challenging the dominance of cars appears to be literally unthinkable to him (I have to confess I think his being American has something do with this). * cute name, badass animal! Excellent article. We live and cycle in London but have just returned from the Netherlands with our bikes. I am only sorry that we could not not, as those Dutch cyclists allegedly did, turn around and go back to the Netherlands. The culture shock after cycling there for a few days is huge when one arrives at London Liverpool Street and has to cycle in the madness and confusion of rush-hour in the City of London. It takes a few minutes to get used to it again. I suppose Forester would argue that it is our fault for making an ill-advised trip to a country which encourages incompetent cycling! Out of interest, are Forester’s ideas influential? 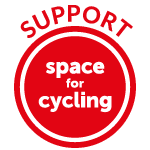 I mainly hear about them on this blog and I can’t imagine many people taking they too seriously (except maybe as a cynical way to justify poor cycling provision). They’ve been influential to the extent that John Franklin borrowed them, and used them to inform official British cycle training standards – Bikeability. Indeed the whole modern Vehicular Cycling ideology originates with Forester. I sometimes think that the conversation about cycling is too dominated by people who race (or want to race). I find some of what is done, worn, said and spent pretty ridiculous. It’s great that different people have different approaches to cycling but I think it is a mistake to think that this has much relevance to people outside of that community. A short brochure to help people get in to cycling, distributed with the Prudential Ride London event, mentions that they should consider not wearing underwear. At that point I had to check it wasn’t a spoof. Added to that some of the choice words of our sporting heros and I think this is altogether unhelpful for getting normal people on bikes. Imagine what Dutch people would say if you tried to give them that kind of advice (well actually they are very polite, so they might not say much but they’d be thinking it!). Sorry I just got sent a link to ‘the rules’ and I know it is meant to be tongue in cheek but I don’t think it’s that far from the truth for many people – it slightly got me going! I would like to have the right for me and my children and in time my grandchildren to be an incomptent cyclist (some will say that I am already) and not be killed or seriously injured as a result of my incompetence. Dutch style infrastructure would give us that right. Incompentent cyclists my arse. When cycling in town in The Netherlands you really have to pay attention to where you are going and be confident about where you want to go otherwise you’ll get knocked off your bike by another cyclist, or possibly a moped. You need to pay attention to the very small hand signals and other gestures that other cyclists make, and also make them yourself so that you know where people are planning to go. The little road markings are very important to get used to too. Sometimes you have priority and sometimes the cars have priority, but they may even stop for you, in which case you have to be quick to realise that and get going. It’s not the first time today that I’ve managed to go the wrong way across a crossing, or take the pedestrian crossing rather than the cycle crossing as I had missed some visual cue that other locals were used to. Overal I’ve felt a lot safer as I’ve not had to deal with fast moving traffic in the same lane as me, I have had to deal with motor vehicles, however it’s always been when they are at low volumes and at slow sleeds similar to me, unlike the UK where often high speed vehicles will be passing me close by.